Here are a few questions that seem to be the most commonly asked when speaking with people. 1. What colours do TM's come in? There is a wide variety of colours: black and tan, black, gold, chocolate, blue and tan, blue.... White patches can be found on any colour. 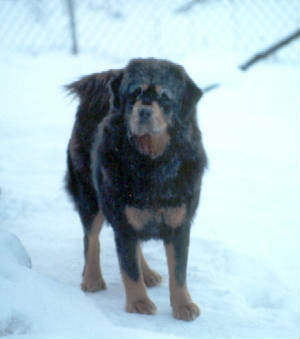 Also the tan markings can come in different shades. They can have a speckling around the eyes. 2. Why is there such a wide variety of looks? 3. 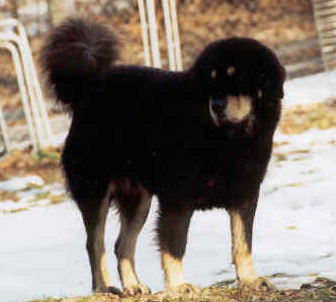 Is the Tibetan Mastiff the right breed for me? Are you prepared for the struggles that lay ahead?! This breed will test your patience time and time again. They are stubborn, independent, vengeful and can be destructive! 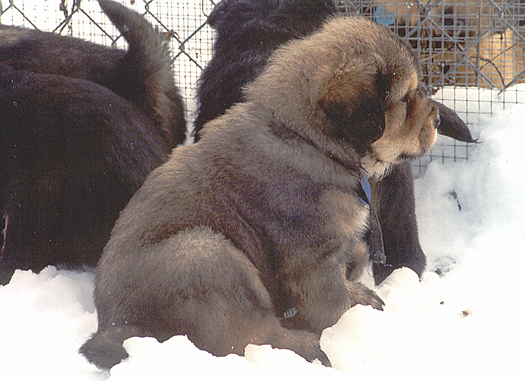 There is nothing routine with a Tibetan Mastiff. They require a considerable amount of attention. 4. What is their temperment like? They each have there own personality. Some will be aloof while others can't wait to kiss anyone in a 5 mile radius. Being a guardian, TMs are valued for their independent nature, however, this can make them a huge challenge. You must win them over with trust and positive reinforcement, never intimidation, and they still might not do what you want. They want to be treated as a companion not just a mere pet. 5. How are they in the house? Generally speaking, a happy TM is very well behaved in the house, but as previously stated, they can be vengeful and destructive. Abandon them for any great length of time and expect punishment! 6. Are there differences between male and female? They are both equally protective. Males might tend to be more carefree and independent from the family than the females. 7. How are TM's with other animals? They integrate well with other animals if socialized from an early age. They are territorial. Being a flock guardian, the TM will usually take over the "alpha" position and consider himself boss. Who's going to argue? 8. 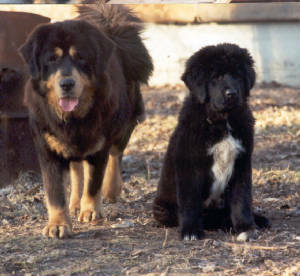 How is this breed typically with children? TMs have a lot of patience when it comes to children, however care should be taken when strange children are in the company of the family. 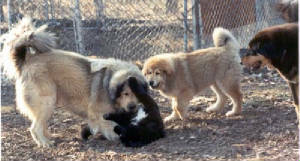 Rough play may be taken as a threat. They generally are fine with strangers but if acting in a threatening manner, the TM will protect and defend. They are not aggressive to man or beast unless provoked. 10. How much excercise do they need? They need exercise which would ideally be achieved in a large fenced yard with a canine companion. 11. Any special grooming requirements? Training is definitely a must! Basic obedience classes are strongly recommended. Don't send your dog to be trained by someone else. If you do, who'll train you? 13. How big is my puppy going to get? A mature TM(4-5 yrs) can be anywhere from 100 to 180lbs and 27" to as tall as 34" for the males and 85-140lbs, 25"-30" for the females, all depending on the variety and bloodlines of the sire and dam. 14. How much do they eat? They do not eat as much as one would think. They are fairly energy efficient. 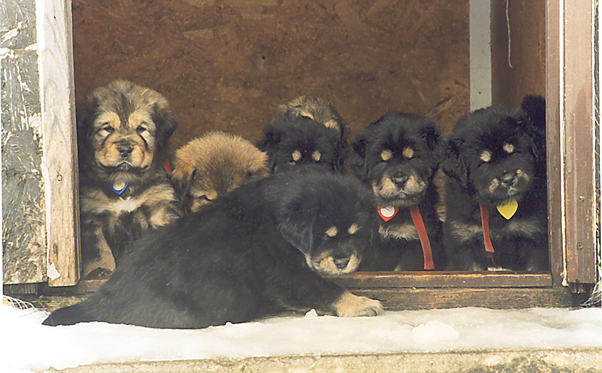 You will notice that their appetites certainly taper off in the warm months and pick up when the temperature drops. We range feed, meaning that there is always food available to them and they eat when they're hungry. They do not gorge. Mind you, a growing puppy can certainly pack it away! You'd think he's got hollow legs. 15. How do they adapt to different climates? Although adaptable to almost any climate, they prefer it cool or cold. They can endure the heat if it is a dry heat. 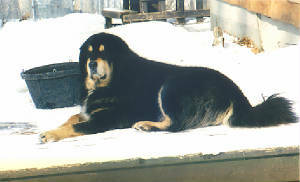 Tropical conditions would not be suitable for a Tibetan Mastiff. They normally do not drool unless they are excited, nervous or just after having a drink. 17. Do they have any bad habits? YES! 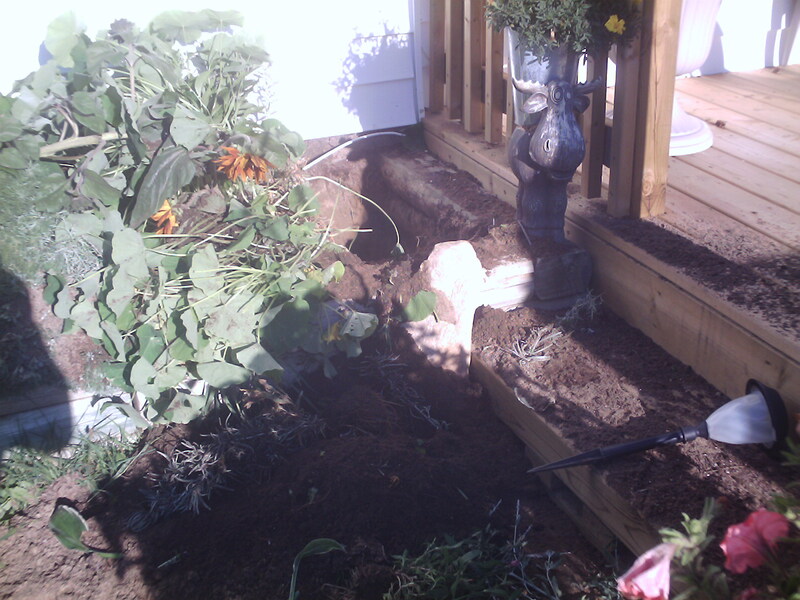 Digging, chewing. With firm but loving consistent disipline, this can be avoided, or at least controlled! Excessive barking at night can also be a problem. Restraint can be taught. These might be trying times for you and your TM! 18. 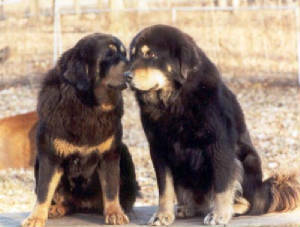 Can you give a general overview of the Tibetan Mastiff? Sweet, mysterious, very stubborn and independent. STRONG! FEARLESS! Fun loving, in need of physical affection. Noble, dignified, maybe a touch conceited. In other words, they are a complete joy to have around!